As any Traffic reader knows I have a jones for “collective animal mobility.” I recently across an interesting paper, “Traffic and the visual perception of space,” by Petr Šeba, a physicist with the University of Hradec Králové in the Czech Republic. During the attempt to line up into a dense traffic people have necessarily to share a limited space under turbulent conditions. 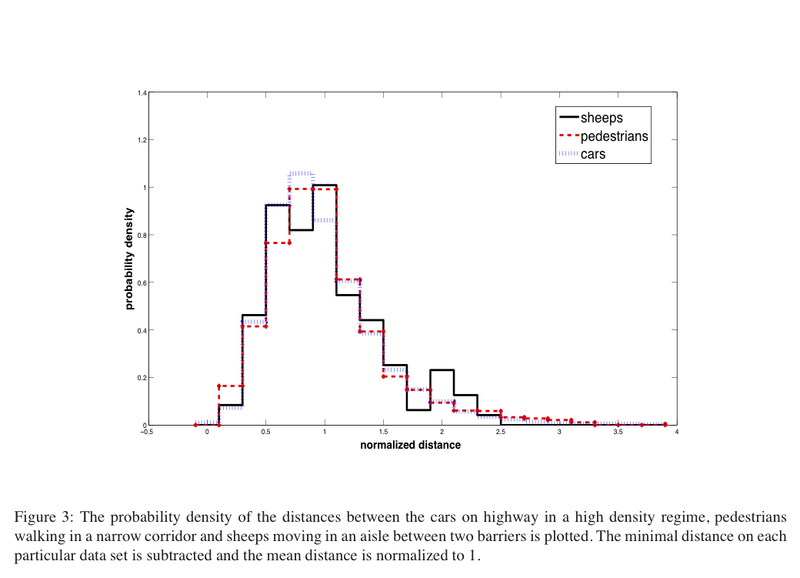 From the statistical point view it generally leads to a probability distribution of the distances between the traffic objects (cars or pedestrians). But the problem is not restricted on humans. It comes up again when we try to describe the statistics of distances between perching birds or moving sheep herd. Our aim is to demonstrate that the spacing distribution is generic and independent on the nature of the object considered. We show that this fact is based on the unconscious perception of space that people share with the animals. In order to verify this hypothesis we organized a simple experiment with pedestrians in a narrow corridor. Using two light gates we measured their velocity and the time interval that elapsed between two subsequent walkers. This enables us to reconstruct the mutual distances and evaluate the distance probability density. The same device and method was used also for a sheep herd moving through an aisle between two near yards. The third source of data are cars moving on a highway in a dense traffic. The velocity and time stamps of the individual cars were obtained by induction loops placed below the roadway. The probability distribution of distances between objects in all these cases was essentially the same (suggesting, according to the author, a universal mechanism for estimating time-to-collision and its avoidance). Something to consider in those long holiday security lines at the airport. This entry was posted on Tuesday, March 30th, 2010 at 8:11 am	and is filed under Traffic Wonkery. You can follow any responses to this entry through the RSS 2.0 feed. Both comments and pings are currently closed.